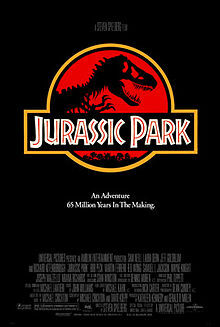 There are thousands of reasons why Jurassic Park holds up so well over 20 years after its initial release in 1993: Steven Spielberg’s ability to evoke a sense of wonder; John Williams’ score; ILM’s restrained use of computer-generated effects; the fun dialogue (“clever girl”); and, of course, seeing realistic-looking dinosaurs on screen. Other reviewers have analyzed this movie to extinction, so I don’t want to waste time rehashing the obvious. That said, I do want to raise a few points about how the film was adapted from Michael Crichton’s novel Jurassic Park. 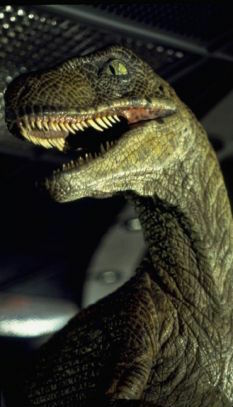 First, the film treats the dinosaurs like animals rather than monsters. They have dietary needs, get sick, sneeze, and mate, just like any animal. Aside from making the Velociraptors somewhat larger than they are in real life, the film doesn’t go out of its way to make the dinosaurs especially terrifying. Neither the Tyrannosaurus Rex nor the Velociraptors are “villains”; they’re just doing what comes naturally to them. The film invites viewers to not just fear dinosaurs, but to enjoy them and take wonder in them. Of course, dinosaurs are animals, but this was quite revolutionary as most horror movies had simply treated large animals as monsters (Jaws certainly didn’t inspire much love for great white sharks). Second, the film works on multiple levels. In fact, it’s quite difficult to place Jurassic Park in a single genre. Fans of horror movies will enjoy the jump scares and hide-and-seek between the kids and the raptors. Despite this, the movie never takes itself too seriously and injects comedy into even the darkest moments. It has some of the best action/adventure of the 1990s, especially the iconic scene in which the T-Rex almost overtakes a jeep. Because Spielberg took such care with the scientific accuracy of his depictions of dinosaurs, the film even had an educational component by dispelling then-popular myths about dinosaurs being slow and dumb. In short, no matter your mood, no matter your tastes, something in Jurassic Park will likely appeal to you. This is no small credit to Steven Spielberg’s adaptation. Crichton’s novel is much more serious, at times even depressing. I remember feeling somewhat sickened reading about the dinosaur attacks on innocent civilians. The dinosaurs are treated as the enemy, to the point where game warden Robert Muldoon hunts down Velociraptors with a rocket launcher (remember, in the movie, the humans don’t kill any dinosaurs). As I’ve argued here, I’m generally averse to changing the tone or genre of source material for a film adaptation. However, in this case, I think Spielberg rightly recognized that the brilliant part of Jurassic Park was the core concept of resurrecting dinosaurs through a scientifically plausible process. By downplaying the horror aspect, Spielberg actually added more layers to the film. Finally, the way the film positions John Hammond makes it both more fun and more interesting than the book. In the book, Hammond comes across as a cold business tycoon who denies the seriousness of his failure, even after the dinosaurs escape and his grandchildren are in danger. Near the end, a pack of Procompsognathus kill Hammond after he trips and breaks his ankle. I guess he receives poetic justice, but it’s also cliche to have the monster attack his the cold-hearted creator (see Frankenstein, etc.). By contrast, in the movie, Hammond comes across as much more personable, even grandfatherly, thanks in large part to Richard Attenborough’s performance. He still deludes himself that he can solve the problem with technical fixes, such as better screening for employees or security procedures. But they’re the delusions of somebody who cares. The film never makes Hammond to be the villain, even though his hubris arguably got several people killed (in fact, the film has no villain). Viewers are likely to have a much more complex relationship with film Hammond, feeling both sorry for and frustrated with the man at the same time. This forces us to confront the fact that even good people can fall prey to the sins of hubris and arrogance. Personally, Jurassic Park is one of the first films I remember seeing in theater. It was also the first time I had truly experienced a blockbuster phenomenon, when friends and neighbors raved about a movie. It’s also one of the only times a movie lived up to the hype. I’m convinced that it’s endured so well is because it has so many layers and can appeal to so many different types of moviegoers. As a kid, I loved seeing realistic dinosaurs on screen. As an adult, I’ve also come to enjoy the subtle character interactions and thematic message.